Probing question: What is a molecular clock? It doesn't tick, it doesn't have hands, and it doesn't tell you what time of day it is. 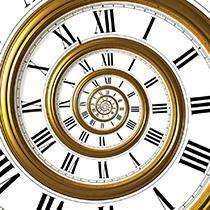 But a molecular clock does tell time -- on an epoch scale. The molecular clock, explained S. Blair Hedges, is a tool used to calculate the timing of evolutionary events. Instead of measuring seconds, minutes and hours, said Hedges, Penn State professor of biology, the molecular clock measures the number of changes, or mutations, which accumulate in the gene sequences of different species over time. Evolutionary biologists can use this information to deduce how species evolve, and to fix the date when two species diverged on the evolutionary timeline. "Unlike a wristwatch, which measures time from regular changes (ticks), a molecular clock measures time from random changes (mutations) in DNA," Hedges noted. The concept of a molecular clock was first put forward in 1962 by chemist Linus Pauling and biologist Emile Zuckerkandl, and is based on the observation that genetic mutations, although random, occur at a relatively constant rate. Thus, the theory goes, the number of differences between any two gene sequences increases over time. As Hedges explained, this thinking led to the idea that the number of mutations in a given stretch of DNA could be used as a measure of time. “A nice aspect of molecular clocks is that different genes evolve at different rates, which gives us flexibility to date events throughout the history of life” Hedges pointed out. Broadly speaking, the evolution of important genes occurs more slowly than that of genes with less vital functions. More rapidly changing genes are used to date more recent evolutionary events, and slower evolving genes are used to map more ancient divergences, he explains. The molecular clock also can be used for putting a series of evolutionary events into chronological order. This is done by comparing sequences from different species to determine when they last shared a common ancestor, in effect drawing the family tree. “It’s often difficult to do find common ancestors between species using fossils, no matter what the organism,” said Hedges.